One of the hardest parts of writing a novel is dealing with backstory. How much of each character’s past should you put into your story? When should you put it in? Backstory adds texture and depth and motivation to a novel, but you don’t want to stop the momentum of your story with endless flashbacks to someone’s childhood. I’m dealing with two additional layers of backstory complexity in the novel I’m working on now, which is set in the world of Dover Beach. First, as a sequel, the novel is dealing with characters and situations that have already been introduced in the first two novels in the series. I can’t reintroduce the history of the characters and the plots of the first two novels without annoying readers of those novels. 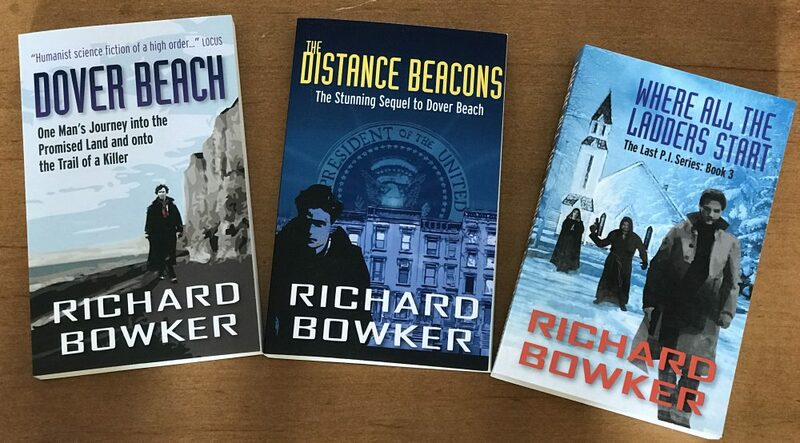 On the other hand, I’ve got to say something about the stuff, or else new readers will be baffled; and I can’t assume everyone will start with Dover Beach and continue with The Distance Beacons before beginning Novel to be Named Later. I’m not sure there is a good solution to this problem; at least, I haven’t found it. I have made a conscious decision to dribble out only a small amount of backstory about the world in which The Last Private Eye novels take place. After two novels we know there was some kind of nuclear war, but we don’t know who the combatants were, why the war was fought, who won . . . We don’t know any of this stuff because it’s not relevant to the characters and their story. They don’t really care; they’re just stuck in this world and trying to get by. So the backstory is irrelevant. Also, it would slow the story down. But I can guarantee that you’ll know more of this backstory at the end of TNTBNL than you did at the end of Dover Beach. This entry was posted in Writing and tagged fiction, novel, novels authors, science fiction, writing by Richard Bowker. Bookmark the permalink. I just started a short story last night. Well, it started out as a short story but it’s now threatening to break into a full blown novel. The story opens with two characters trying to break into a vault when an alarm goes off. They have to try to escape without whatever they came for and they’re being pursued. The funny thing is I don’t know anything about them yet. Who they are. What they were after or even if they’re good guys or bad guys. It’ll be fun finding out. My point is I guess I’ll be filling in some backstory as and when it comes to me. I certainly don’t have any to put in yet! It is like playing with a snake. You have got to be careful, and don’t do it often.